This is one of my personal favorites, especially if you can pick your watercress locally as we are lucky to be able to do here on Martha's Vineyard. Friends often request this quinoa salad and I happily oblige because it’s a snap to make and goes well with everything. The quinoa cooks in 12-14 minutes, and just a simple dressing of lemon juice and olive oil seasons it perfectly. Add quinoa, salt and 1 2/3 cups water to a saucepan. Bring to a boil and then reduce heat to low, cover, and cook for 12-13 minutes, or until the water is absorbed. Turn off the heat and let the quinoa sit for 5 minutes. Turn into a large serving bowl to to cool completely. 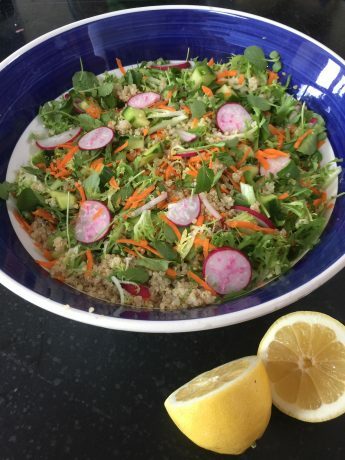 Combine the cooled quinoa, with watercress, frisee (if using), cucumber, carrot, and radishes. To make the dressing, in a small bowl, whisk together all of the lemon juice, olive oil and salt. Just before serving, add dressing to the quinoa and vegetables and toss gently to combine. If there is any salad left over, refresh it with a bit of lemon juice and olive oil and serve at room temperature.